First up of course is the answer to our Mystery Bird Challenge #5. The answer is a female Violet-backed Starling. Looking quite different from the male of the species, whose vivid purple colouration and contrasting white belly make it unmistakeable, the female is a little harder to ID. The streaking on the belly and the brown colour were the giveaways here. Although the female has a yellow eye, one can’t see it in this picture owing to the shadow and the distance, so it was the streaking and colouration that were the major clues. Well done to everyone who got it right! It was a fairly leopard-heavy week – at least for me – which the photographs will reflect. Although I don’t usually like commenting about the general state of the weather as that gets pretty cliched pretty quickly, I should mention that the mercury was up in the low 40s (Celcius) a number of times this week, which meant that we, as well as the animals, were seeking shade like our lives depended on it. 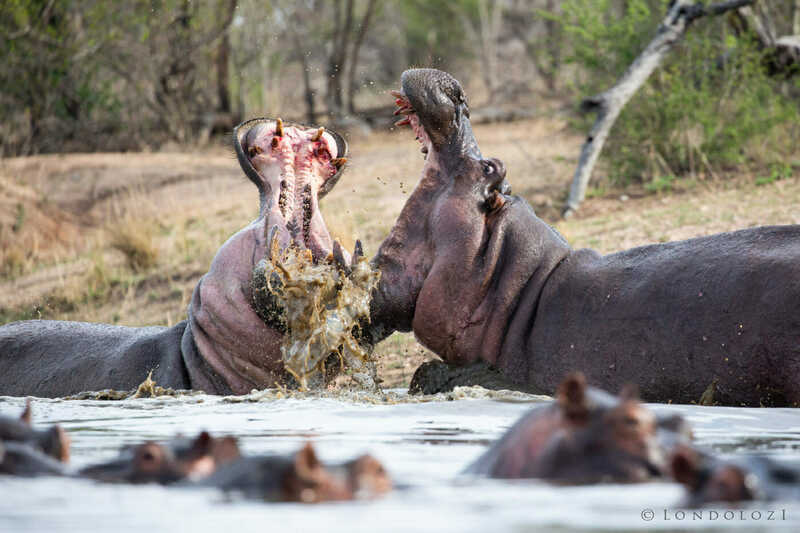 The heatwave didn’t slow things down however, and the highlights of the week included two hippo bulls fighting, some incredible lightning storms, TWO pangolins, and the warthog litters starting to emerge from their various dens about the reserve. These two hippos were going at it hammer and tongs for about an hour. We had to return to camp and they were still fighting, and who knows how long they had been battling each other before we arrived? One can see blood in both of their jaws, and the width of their gapes is truly astounding. One needs no further proof as to why these are some of Africa’s most dangerous mammals. 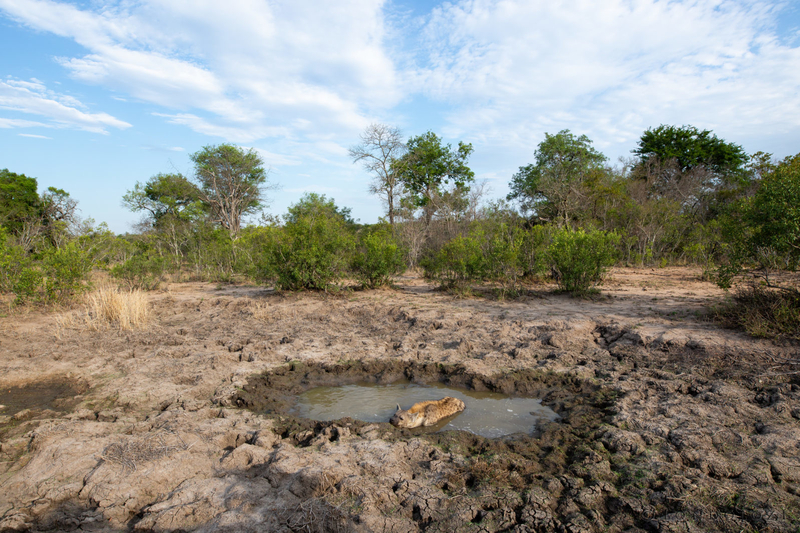 A spotted hyena cools down in a dwindling pan as the morning temperature starts to rise. Hyenas and Wild dogs will both lie in waterholes and pans in order to stay cool, a behaviour that has not really been recorded in their feline counterparts. The Nkoveni female and her cub at their moment of reunion. 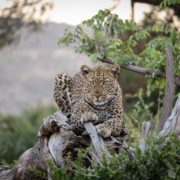 Trackers Life Sibuyi and Innocent Ngwenya had been following the tracks of the pair through a dense Tamboti thicket when they radioed to say they could hear a leopard contact calling close by. Not wanting to spook the leopards on foot, they hung back but directed the vehicles in. One of the Land Rovers caught sight of the cub, contact calling for its mother, and barely a minute later the Nkoveni female emerged from up out of the Sand River. We spent the better part of the next two hours with the two leopards after this. 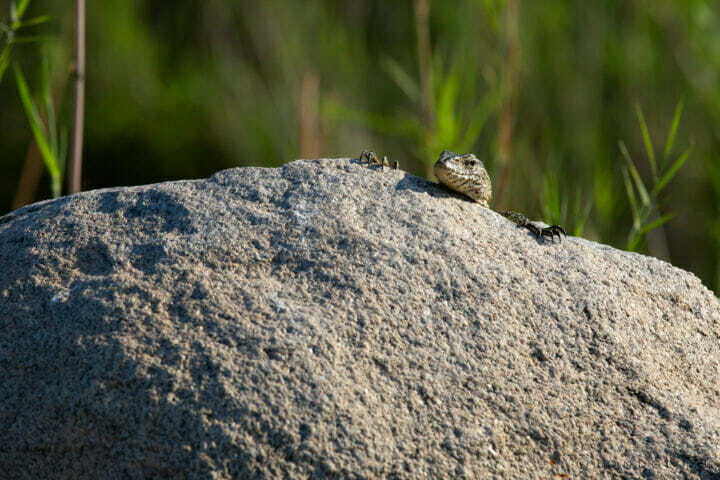 A water monitor peers over a granite boulder in the Sand River. These lizards aren’t quite as large as the rock monitors that we also find here, but are far more common, being regularly seen foraging along the riverbanks and fringes of waterholes. Scamper! 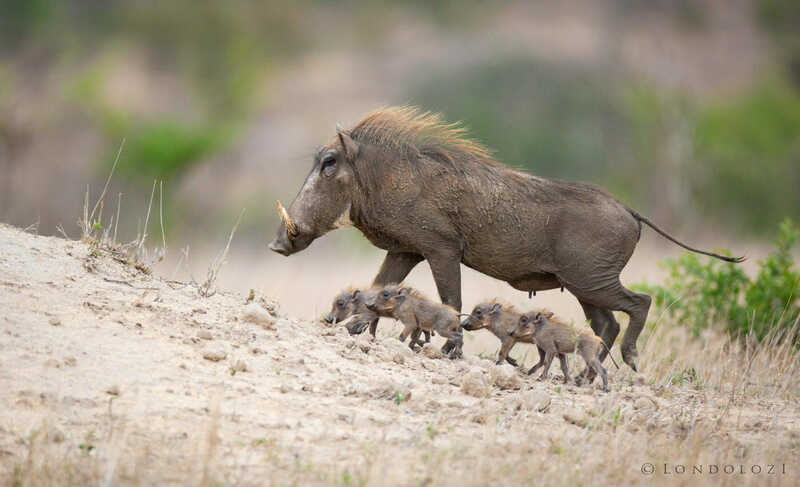 The season’s first warthog piglets scurry after their mother. Incredibly vulnerable at this early stage of their lives, tiny piglets seldom stray more than a couple of feet from each other or their mother, and even the shadow of a bird flying over is enough to spook them. Well before sunset, the female led her piglets back to their burrow. 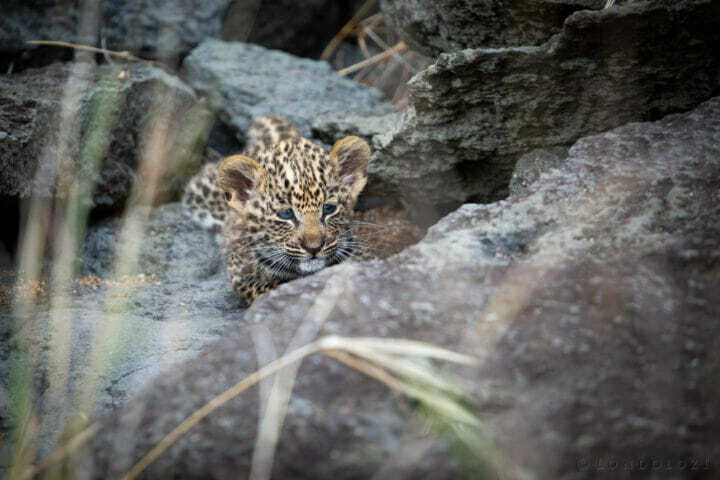 One of the smaller leopards currently inhabiting Londolozi; one of the Ximungwe female’s cubs. These are the first offspring born to this leopard (formerly the Mashaba young female), and she has been stashing them in the Tugwaan drainage line in the southern parts of the reserve. We enjoyed some fantastic viewing for a couple of weeks but it seems as thought she may have moved the den in the last few days as sightings have dried up. 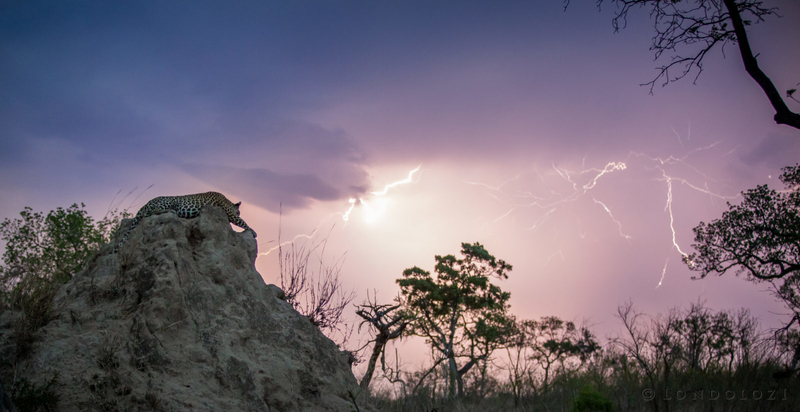 A spectacular summer storm breaks over Londolozi. These storms can unleash a fury of rain in a matter of minutes or they can tease us for the afternoon, dropping only a few millimetres. 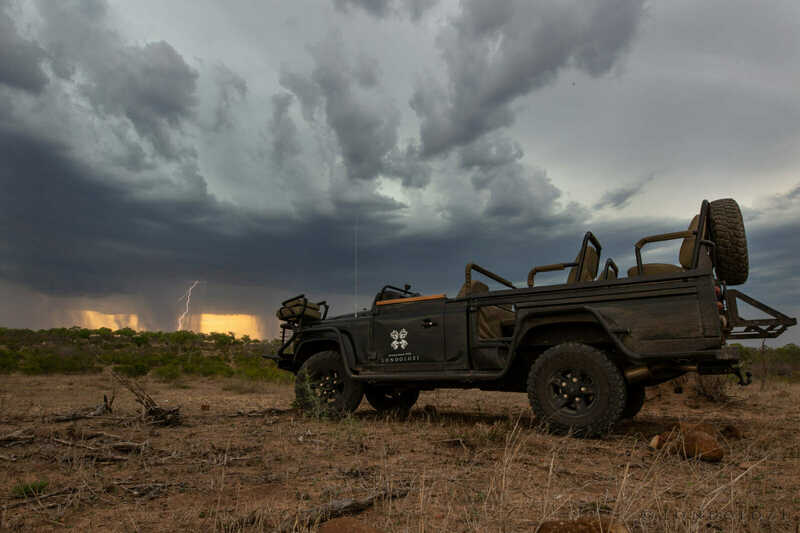 This was one of the more dramatic ones, as after an hour of beautiful lightning strikes in the distance, it suddenly swept in over the camp, unleashing some tremendous thunderclaps and lightning strikes, causing all the game drive vehicles to rush home! A tree agama falls prey to a western stripe-bellied sand snake. To be honest we were convinced the snake wasn’t going to be able to fully engulf the lizard, being so skinny, but amazingly after probably 45 minutes of stretching its jaws and neck, it managed to get it down whole. 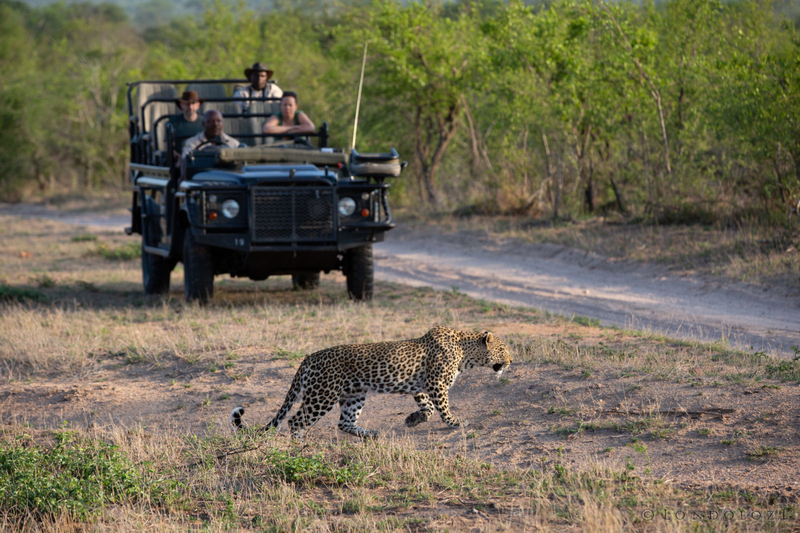 Sandros Sihlangu and guests look on as the Nkoveni female heads towards a thicket line. It’s my personal project to capture as many photos of this amazing guide as I can as he’s notoriously shy of pictures. It always has to be when there’s an animal in the foreground else he’ll find some means of ducking out the way! Now THIS was a rare sight! 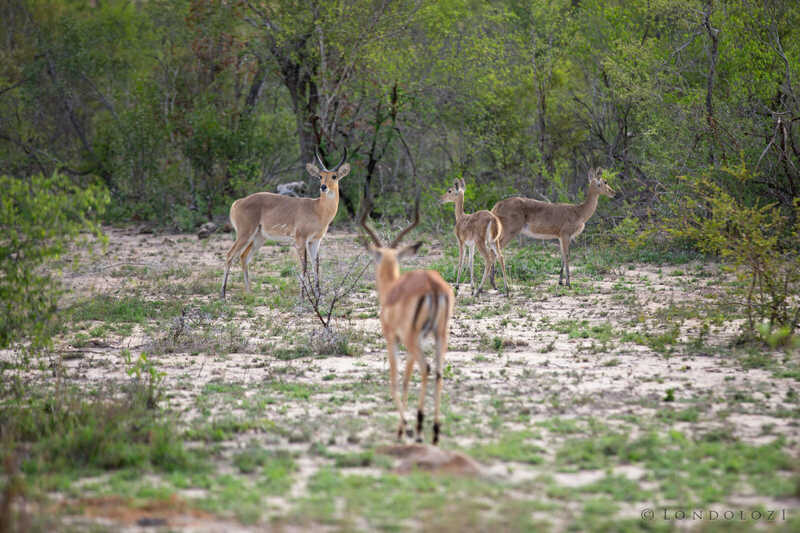 A reedbuck family; ram, ewe and lamb (or is it a calf?). I was driving with then-head Tracker Richard Siwela a couple of years ago when we came across a female and a calf, and Rich related how it was his first sighting of a reedbuck youngster in 40 years at Londolozi. To see these three out in the open, when they normally favour long grassy areas and reedbeds as their name suggests, was completely unexpected! 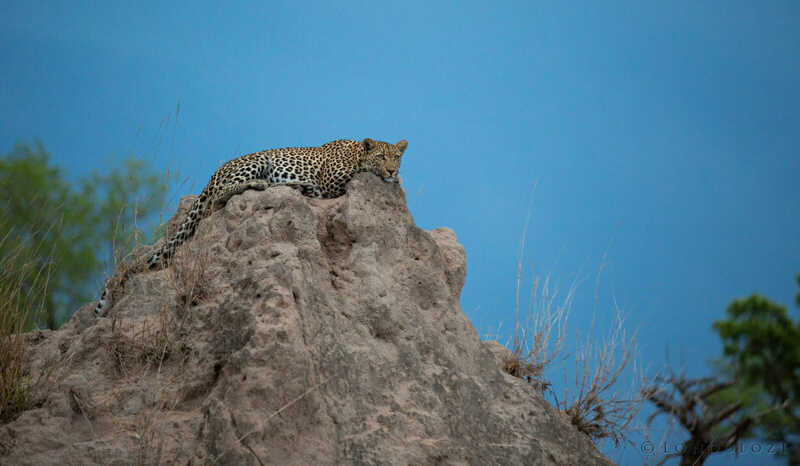 The Ingrid Dam young female reclines languidly on a termite mound as moody storm clouds in the background create an electric-blue sky. 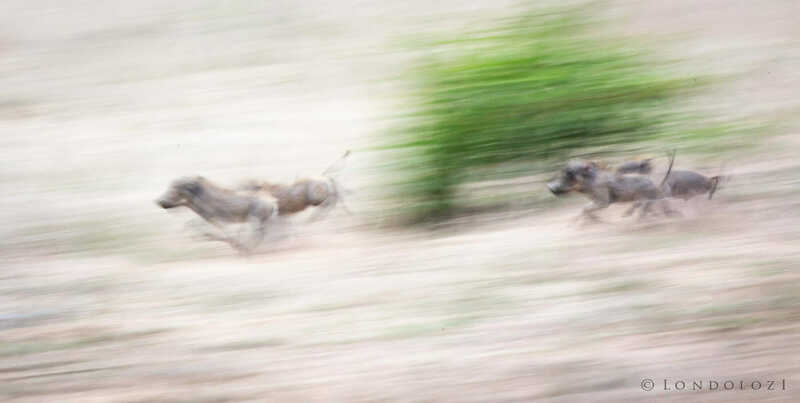 She had been stalking a herd of impala but just before it seemed like she was about to rush in, a hyena emerged from the thickets and they scurried off, spoiling her chances. The same female a few days later, descending a steep bank of the Manyelethi River. There is a small pool of water about 50m to the right of where this picture was taken which is currently serving as an incredibly focused area of game viewing, as it is the only permanent water for a couple of kilometres in any direction. Knowing this, predators are regularly found staking it out, with this female in particular being seen regularly in the area. Londolozi’s best sighting of the week; a pangolin and her pup. 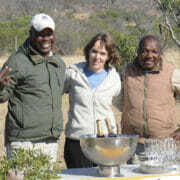 Fin Lawlor and Innocent Ngwenya had stopped for coffee in the Maxabene riverbed when Innocent spotted the tail of the mother poking out from a hole in the base of a Jackalberry tree. 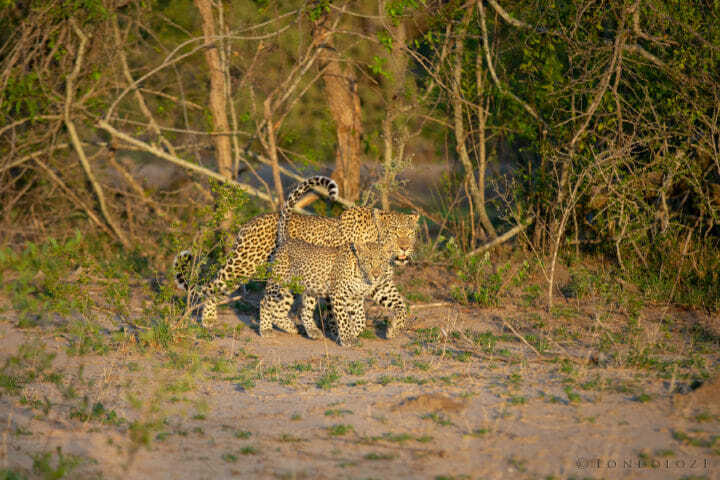 That evening, Londolozi staff waited until 10pm to watch the pair finally emerge to begin foraging. Pangolin young will ride on their mother’s backs when they are still small, as pictured, but given this one’s size relative to its mother, it probably won’t be long before it is walking on its own. The Ingrid Dam young female yet again, on a termite mound seemingly just as intent on the distant lightning as we were. The dark conditions and the lateness of the shot necessitated a high ISO, which unfortunately made the photograph a little grainy, but photography is all about compromise. Stunning pics this week but the highlight must be the pangolin. Amazing lucky sighting. Great TWIP! LOVED that pangolin photo! That is a sighting of a lifetime! Thanks for sharing! Regarding your “compromise” on the Ingrid Dam female with lightening, James, to paraphrase Tevye, “It’s a curse. May God strike me with such a curse and may I never recover! James, what a week you had. 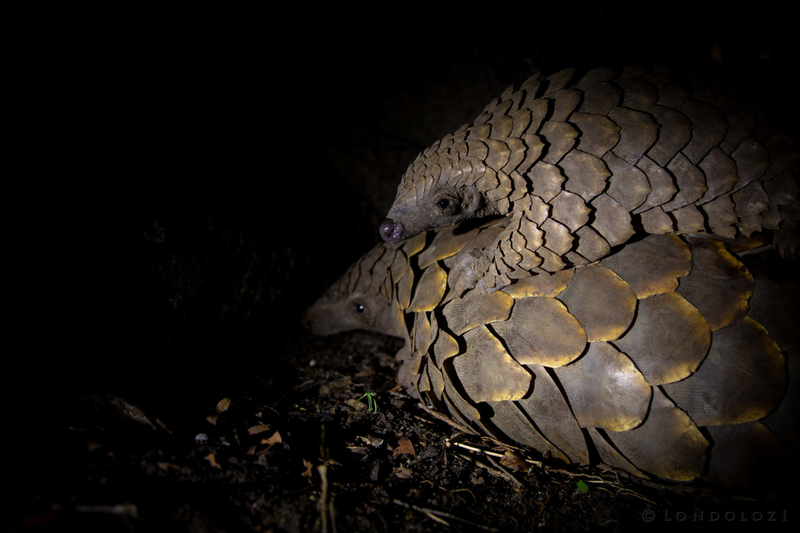 A Pangolin, the holy grail of animal sightings….. still a phantom for me. I keep waiting and hoping that the next trip will yield a glimpse. At least I finally saw bush babies and the honey badger on a drive back to camp one night. 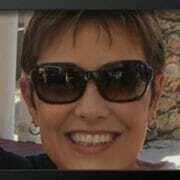 Love the Ingrid Dam female a she’s so feminine and beautiful. Wishing you all a wonderful few days of holiday celebrations. Wonderful pics as ever, James, hard to pick a favourite. Wishing you all a very happy Christmas and New Year. 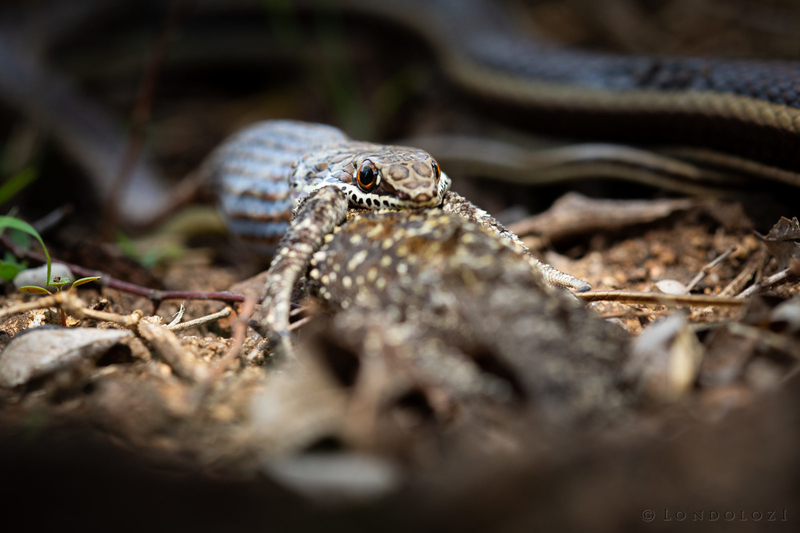 Photo of the stripe-bellied sand snake eating the tree agama was amazing–incredible. 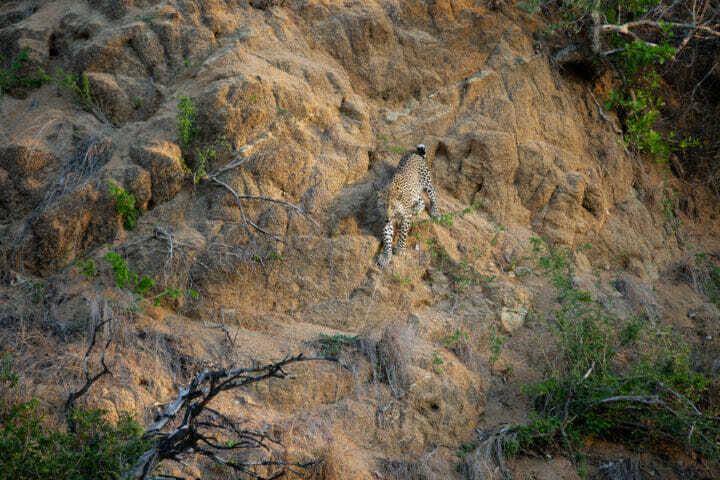 An absolutely incredible range of photos, especially on the leopard front!!! Those shots of the Ingrid Dam Young Female are sensational, as was that shot of the Ximungwe Female’s new cub (I’m looking forward to keep track of their progress). I also love that photo of the vehicle against the backdrop of the lighting storm. 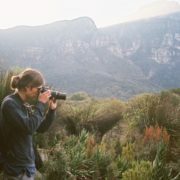 And I have no words for the double pangolin and triple reedbuck sightings!! My joy at the pangolin picture dwarfs my pouting that I didn’t see on on my recent visit:-) And a youngster! The world needs more pangolins!